Gucci Flora was like my guilty little pleasure where I knew the fragrance wasn’t super sophisticated, but I still like it and wear it anyway. So I got curious when I saw they had come out with some Flora flankers. I had my reservations, after all, Flora wasn’t anything to call home about so how good could the flankers be? I know I shouldn’t judge a flanker by the perfume it was modeled after. But what bothered me most about Flora Gorgeous Gardenia was its somewhat silly name. In Bottle: Pear and sweetness with a little touch of floral. Applied: Pear upfront with the sweetness rolling out its game very quickly. Gorgeous Gardenia smells of candy and lace and fruity summer drinks with little umbrellas in them. After the initial blast of fruit juice and candy, Gorgeous Gardenia settles down a bit and introduces a very mild and difficult to pick up floral element. I can’t say the gardenias are making much of a show as this tends to enjoy smelling like generic flowers and sugar. The sugar in this isn’t too strong. It’s actually used rather well, giving the fragrance a soft lilt that sort of brushes your nose instead of slamming into it. I like that about it, but as for everything else, it’s a pretty bland affair. The dry down isn’t very noticeable either with the sugar cleaning itself up a bit and leaving a ghost of itself behind with a dry and cleanly scrubbed patchouli note finishing the scent. Extra: Gorgeous Gardenia is only one of five Flora flankers to be released. The other four are Generous Violet, Glamorous Magnolia, Glorious Mandarin, and Gracious Tuberose. Makes me wonder what other “G” words they can come up with to couple with some unsuspecting flower. Perhaps we’ll get Grandiose Rose. Design: I really liked the design of Gucci’s Flora and the more I used my little 30ml bottle, the more the design grew on me to the point where I decided it was adorable and that I loved it–just in time for all the juice to run out. Still, I liked the packaging for Flora and I like the packaging for Gorgeous Gardenia which is largely similar except in a tall bottle as opposed to squat and with pinkish liquid. Notes: Pear, berries, gardenia, frangipani, patchouli, sugar. I did like how Gorgeous Gardenia smells, but it’s far from interesting or new. It’s a very functional fragrance much like Flora–though the two don’t smell alike. Gorgeous Gardenia tends more toward sweet and fruity as opposed to sweet and floral like Flora did. 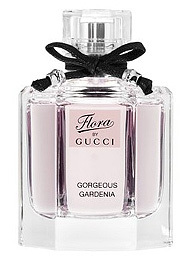 Reviewed in This Post: Flora Gorgeous Gardenia, 2012, Eau de Toilette. 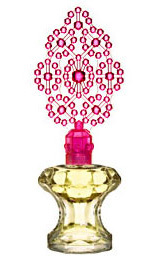 Cosmic Radiance is a flanker from Britney Spears’ Radiance fragrance. It is supposed to be inspired by stars and jewels and other things that made Radiance a fairly benign fragrance. In Bottle: I had to double check that I was holding the right bottle because this smells exactly like Radiance. Applied: Goes on with a sweet tuberose fragrance with a minor difference from the original Radiance in that I don’t get any tartness in the opening. I get a face full of litchi but otherwise, the tuberose and the sweet treatment of the fragrance is very reminiscent of Radiance. The scent heads into a midstage in the same type of construction too with a tuberose and jasmine treatment and eventually nosedives into the end stage as a clean white musk with a hint of vanilla. My impressions of this stuff don’t differ much between Cosmic Radiance and regular Radiance. It is quite disappointing of a flanker. Extra: Unless you don’t already own Radiance, I would suggest skipping this iteration. There’s not much different to it unless the tartness in the opening of the original Radiance was particularly bothersome. Otherwise, the two fragrances are remarkably similar and if you own one, there really isn’t a point in having both unless you’re a collector or like the bottle design. Design: Same basic design as the original Radiance and I’m still put off by it. It’s got those jewel things on the glass making the bottle look disproportionate and lumpy. The black and clear motif just makes the lumpy look more pronounced. The colors are garish to me too and I just can’t get on board with the look of this thing. 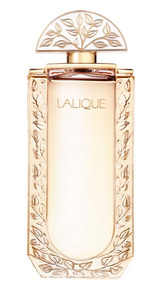 Notes: Mandarin, pear, litchi, peony, jasmine, gardenia, tuberose, musk, sandalwood, vanilla, amber. I have to give Cosmic Radiance a thumbs down for not being at all different from the original Radiance. It should be reiterated that Radiance was–while a bit pedestrian–a decent fragrance. I just didn’t think there needed to be two versions of it that smell almost exactly alike. 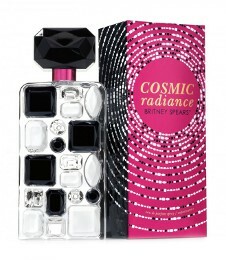 Reviewed in This Post: Cosmic Radiance, 2011, Eau de Parfum. Pear Glacé is like a strange little nugget from my younger years. It was the thing that convinced me I didn’t much like pear scents way back when this fragrance was still being sold by Victoria’s Secret. Even thenl, I thought this was too sweet. So why not uncap and dust off the old body mist and see if my mind has changed? In Bottle: Sweet pear with a slight herbal quality to it. Applied: Extremely sweet pear opening that’s reminiscent of cough syrup for children. There’s a hint of violet in this, further sweetening the scent as well as imparting a slight powderiness as well. 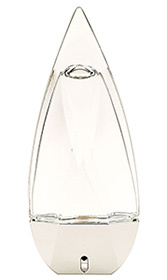 The pear gets extremely sweet as the fragrance wears on to the point that it reaches cloying levels. This just takes me back to the time when I first tried this and decided it wasn’t for me. Evidently, it still isn’t for me though I am amazed the fragrance seems to have held up well over the years considering it’s a synthetic fruit-based fragrance, and a body mist that’s contained in an unsealed plastic bottle. Granted, I could be remembering the fragrance wrong as well but it seems to me like this was exactly what it did before. Anyway, the pear scent sticks with the fragrance as it ages but the longer I wear this, the more that cassis and violet thing gets stronger and stronger, imparting more sweet herbal scent. At this point I’m thinking the cassis used in this is the leaf as opposed to the berry since I’m getting that herbal quality as opposed to a currant-like scent. Whatever it’s doing and whatever is making this smell herbal, I am not much of a fan. The fragrance ends up with a less sweet finish but with a still present herbal fragrance. Extra: Granted, perfumes (and body mists) can do some strange things when they go off but I think this was actually how Pear Glacé smelled years ago. I wonder if I’m just imagining that herbal note or if something in this stuff actually went off. The one thing I do remember of this scent was the cloying pear and how much it reminded me of cough syrup. In either case, Pear Glacé has since been discontinued by Victoria’s Secret but is still available for purchase online from fragrance discounters, eBay, and third-party sellers on Amazon. Design: The bottle for this doesn’t differ much from other Victoria’s Secret body mists–I’m sure the perfume is bottled in a similar fashion as well. The bottle I actually have is considerably older. It’s a plastic bottle with a plastic sprayer nozzle. It works for what it is, there’s nothing really fancy about it. So I’m apparently still not a fan of Pear Glacé though this fragrance tends to polarize people and I seem to be the only person who thinks it smells a little herbal. Tell me I’m not crazy, or am I? Reviewed in This Post: Pear Glacé, ~2000, Eau de Parfum. Oh Lola! is a recent flanker of the original Marc Jacobs Lola, that shampoo-y smelling, not unpleasant but not exciting, clean floral with the massive flower cap. Oh Lola! s presented as a pinker, more stylish version of the original. When someone describes a fragrance as ‘stylish’, I immediately cringe. In Bottle: Fresh and berry-like with a layer of sheer florals underneath, a bit on the sweeter side but doesn’t overdo the sweetness to the point of cloying. Not very interesting but smells decent. Applied: Clean and berry-like in the opening, reminds me a bit of a berry trifle or fruit juice. I swear I can smell a mango note and pineapple note in there. But essentially, the opening is generic fruit punch. It’s clean though and a little sweet as the fragrance ages, the fruitiness meshs more into the florals and lets in some of these flowers we’ve been hearing about. The florals themselves are unexciting, they’re blended well enough that they form this clean, unassuming and easygoing blend of flowery goodness that goes well with the fruity opening. As Oh Lola! heads into the base the scent takes on an extremely dull sandalwood vanilla scent that I haven’t smelled in a while but still remember rather well because every generic-smelling perfume uses a sandalwood vanilla base. “Oh Lola!” is shaping up to be more of an “Oh, Lola, It’s You Again”. Extra: The buzz is already out for the ad campaign surrounding Oh Lola! Dakota Fanning has been chosen as the face for this fragrance and the questionable nature of the ad photo has already sparked something of a sensation around this perfume. I found Bang! and its ad campaign to be a humorous if somewhat lowbrow presentation. I find Oh Lola! to be of the similar vein. Or could we all just be overreacting because we’re used to Marc Jacobs pulling stunts like this? Whatever it is, the ad campaign made me raise a brow, the pink bottle made me grimace, and the description that Oh Lola! was ‘stylish’ made me cringe. Nothing about its presentation made me want to rush out and smell it or buy it. Design: Maybe it was because I was overpinked as a child and have since grown something of a disdain for the color’s reputation as a “feminine” hallmark, but I don’t see why everyone thinks pink is so cute. Pink, when used right, can be cute. Sometimes it can even be sophisticated. If used wrong, it’s a bit burlesque and can even come off as cheesy and childish. So when they took Lola’s bottle, (a perfectly dynamic piece of work) and made it pink, I had to wonder what exactly there was to accomplish here. But I suppose they had to have a flanker look somewhat like the original. And I suppose–if nothing else–pink truly does suit the fragrance. I just find it tired that perfumes would constantly use pink for their fruitier, lighter, less serious flankers of original perfumes. You see a flanker that’s pink and can safely assume that it’ll either be sugary, weak, one dimensional, or a combination of the three. Notes: Strawberry, raspberry, pear, peony, sandalwood, vanilla. All right, so I admit I was chomping at the bit to get at the design of the Oh Lola! bottle. It just bothered me on a fundamental level that I can’t even begin to explain. Nothing on the juice, but the design of the bottle itself just turned me off immensely. Thankfully we’re here for the juice–most of the time. 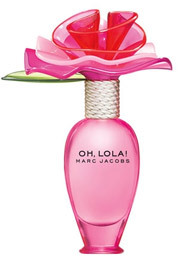 Reviewed in This Post: Oh Lola!, 2011, Eau de Parfum. Okay, let’s get a few ground rules down before I get into the meat of this fragrance review. 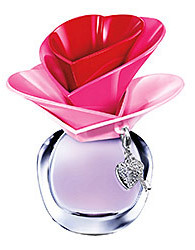 1) Justin Bieber does not know how to compose a fragrance and did not personally compose this fragrance. He may have been given some samplers and told to pick his favorite. 2) Justin Bieber is probably the last person who would know what a woman wants to smell like anyway. 3) This stuff doesn’t smell bad, it just smells like generic celebrity perfume chaff. In Bottle: Sweet fruity floral. It’s very light and easy to wear, but also smells really generic because there’s nothing that sets this fruity floral sweet and clean deal apart from any other fragrance like it. Applied: Soft, slightly sweet, and clean fruity opening with a clear floral heart. There’s jasmine in this for sure, a little bit of lily of the valley I think and probably some sweet and unassuming little flower like heliotrope or freesia. As the fragrance ages, the florals come up a bit more but the scent never really goes anywhere exciting nor does it get any stronger. I don’t think I should even go into complexity because there’s not a whole lot of that going on in this fragrance either. This stuff is light and you may find yourself having to apply a lot of it. I can’t say much for it aside from the fact that it’s got a focus on light and clean florals. The dry down is unexciting with a very sheer blend of white musk and light vanilla flowers. 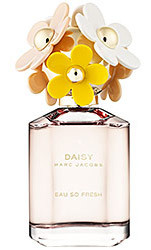 Extra: You’ve probably heard by now how similar the bottle design for Someday is compared to Marc Jacobs Lola. Well, the similarities are there but at the very least the bottle for Someday isn’t an almost identical rip-off of Lola like a certain other perfume. Design: I’m not wild about the design of the bottle. Even the commercial for this fragrance couldn’t really make it look good. The design is amateurish to be honest and comparing it to Lola seems a little insulting. Lola’s a well-balanced, if a little bit loud, of a design. Someday looks like a wobbly child’s art experiment. Maybe I just don’t see the appeal of the bulbous bottle design and the weird flower/heart cap thing. Maybe I’m just too old to think this looks good? Who knows. I just don’t like it. Notes: Mandarin, pear, wild berries, jasmine, creamy flowers, vanilla, musk. So bottom line is Someday is an easy to wear, easygoing light floral scent and you aren’t going to stink if you decide to go out and throw down some cash for this stuff. It’s not special, it’s not unique, but it isn’t bad either. 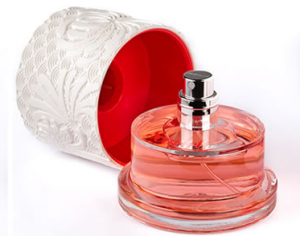 Reviewed in This Post: Someday, 2011, Eau de Parfum.